Delta-like lobes in Aeolis Dorsa. 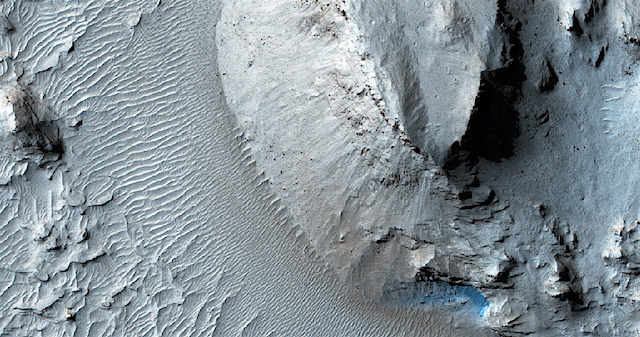 Branching fluvial deposits appear similar to others at Aeolis Dorsa which have been interpreted as delta-like. With HiRISE images and elevation models we would be able to measure deposit thicknesses more accurately. Observations like these may suggest that Aeolis Dorsa is a paleo-coastal region that may be an important site for exploration in the future. This entry was posted in Reports and tagged Aeolis Dorsa, Beautiful Mars, deltas, fluvial deposits, High Resolution Imaging Science Experiment, HiRISE, Mars Reconnaissance Orbiter, MRO, NASA, University of Arizona. Bookmark the permalink.